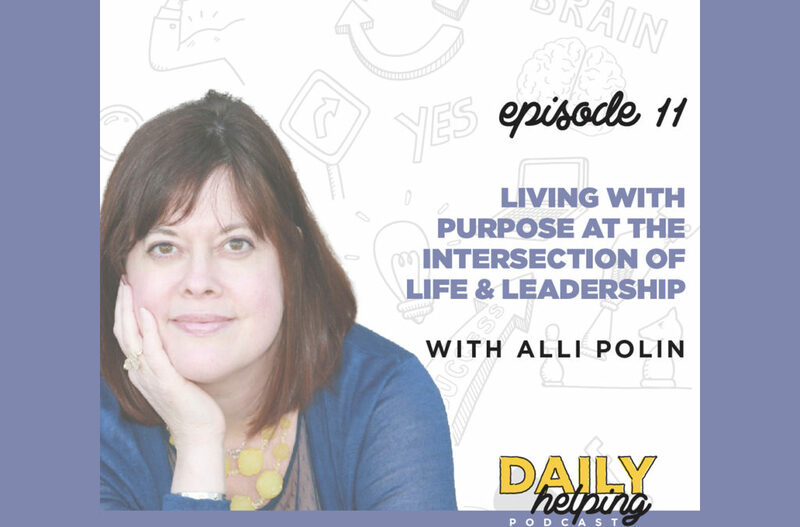 Today our expert guest is Alli Polin, a former senior executive with deep experience in leadership, change management, and organization development who is driven to help others create a full life and achieve professional success. We discuss how people can achieve success through Personal Leadership, and how parents can foster leadership in their kids. Alli’s award-winning blog, Break the Frame, draws on leadership lessons from daily life as a catalyst for breakthrough change and inspires people to engage more purposefully at the intersection of life and leadership. She also wrote one of the 16 stories in Energize Your Leadership: Discover, Ignite, Break Through, a book that helps people discover new ways to get energized, ignite energy in others, and ignite their workplace to break through and create a dynamic future. What is the difference between Organizational Leadership & Personal Leadership? Organizational leadership is typically based on hierarchy, and the people have accountability and responsibility based on their position. Personal Leadership has very little to do with your level. It’s really about being true to living with your values, living with integrity, and leading your life. How does someone develop Personal Leadership skills? There are three elements of personal leadership that you have to develop: Confidence, Competence, and Creativity. The Confidence to speak up and stand up for what you believe in, and for others (whether it’s a personal relationship or an organizational setting). Competence is continuing to grow yourself, invest in yourself, and learn more about yourself. Creativity is about intentionally stretching yourself and challenging yourself to get out of the rut of daily life, and to bring a spark of change. Creativity isn’t about being an artist – it’s about finding new pathways that diverge from the old. Everyday Leadership is an idea very closely connected to Personal Leadership, and the central conceit is simple: leadership doesn’t only belong in a board room. When you go out of your way to offer small acts of kindness, help people feel less alone, and generally acknowledging other people’s humanity, you are practicing Everyday Leadership. One of Alli’s passions is fostering leadership in children, which led her to co-authoring the Parent’s Guide to Leadership. Alli and her co-author share personal stories, the lessons that those stories taught them, and what they then taught their children about being leaders. They also include activities, book recommendations, conversation starters, coloring pages, and more ways to engage with your child on the topic of leadership. The best part? The book is free! Click here to sign up for updates about the publication of the upcoming children’s picture book, I’m Not a Leader, and get immediate access to the Parent’s Guide to Leadership.